Blue Fish is produced by Die Weinmacher Niederkirchen, a highly-respected cooperative with a 110+ year history of successful viticulture in the Pfalz. Their close network of over 400 grape growers strive for a sustainable, healthy wine-growing environment. Die Weinmacher controls all stages of production and works with only sustainable wine growers. In addition, only premium grapes go into Blue Fish, ensuring that the quality remains consistent from year to year, while also bringing the best value possible to consumers. 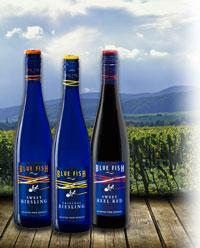 Blue Fish wines are presented in an eye-catching azure blue bottle decorated with colorful labels featuring the distinctive Blue Fish logo. Named "Original" for its internationally acclaimed dry style, this wine is a classic expression of Riesling.